2. Progress in Dialogue: A lot of ground has been covered in the Orthodox-Catholic dialogue. The titles of joint documents produced by the North American Orthodox-Catholic Theological Consultation demonstrates how many dividing issues have been wrestled with and how much work has been done. The embrace of Paul VI and Athanagoras was far more than just a nice gesture in a geo-political game. Let us pray that the next fifty years will mark significantly more cooperation and integration between Orthodox and Catholic Christians. 3. Uniatism is a Blessing, not Curse: The biggest obstacle to Orthodox-Catholic dialogue is said to be Uniatism, and that is true, but not for theological reasons. Uniatism in Slavic countries is a political problem. Anti-Uniatism is an excuse for bigotry and persecution of Eastern Catholics. The Russian occupation of Crimea is just another chapter in a five-hundred-year-long struggle between Ukrainians and Russians. Those of us who are Uniates find Uniatism to be a great blessing, not a curse. We get the best of both worlds: the marvelous Greek liturgical tradition and autonomous freedom with all the stability of the Catholic Magisterium and canonical order. There is tremendous respect and love for Catholicism and Orthodoxy among Uniates. According to Orthodox-Catholic ecumenical theory, union between Orthodoxy and Catholicism will never be an event when all Orthodox believers become Catholic, or vice versa. Recall Archimandrite Robert Taft’s comments on this. In practice, however, Uniatism could be the only actual unity we ever see. Pray that I am wrong, but one of the reasons is that there isn’t One Orthodox Church in the same way that there is One Catholic Church with a single, visible head. Which Churches would in fact unite, or what would that unity actually look like? Again, I refer you to last year’s interview with Taft where we covered this ground, but desire for unity comes back to the Eucharist and the ability to share sacramental life. As Dr. DeVille put it, “We want—we must have—unity around the one table of the Lord.” Sacramental unity should be our ardent desire and prayer request. 4. Canonical Order:The Orthodox churches are very concerned about canonical order and renewal, which is why they are meeting in 2016. All of the autocephalous Orthodox churches agree that a new codification of canon law should be ratified through a future council of the Orthodox Church, and have spent a century preparing for such a council. The need for that future council is obvious to the Orthodox. There is currently an erosion of ecclesial discipline in America due to the inconsistency in the canonical discipline of the autocephalous Orthodox churches. In the absence of an ecumenical council, statutes are being written by Orthodox bishops; those statutes fill the void of new canons but often contradict or, at best, differ in practice from other Orthodox communities living in parallel jurisdictions. For example, one church practice may be to recognize the baptism and confirmation of Catholic converts while, down the block, the neighboring church of foreign jurisdiction recognizes neither Catholic baptism nor confirmation—or one and not the other, but not both. Yet, these are not the main issues under consideration for canonical change. The hot issues have to do with marriage, ordination, and the current role of the “Ecumenical Patriarch” of Constantinople. We can pray for the Orthodox churches, that the Holy Spirit would guide them and help them be faithful to the ancient Faith as they participate in their own version of a Vatican II-type council in 2016. 5. Peter Inspires Unity: Many Orthodox believe they cannot be united with the Catholic Church unless they first find unity among themselves, because they are unwilling to consider Uniatism as a viable option. I understand this viewpoint, and I would like to think they could be united internally. The reality is that the Orthodox churches will probably never be united canonically among themselves. To put it bluntly, the Russian Orthodox are unlikely to agree with the Orthodox of the Balkans on canonical issues, like second marriages for priests, or recognize that the Ecumenical Patriarch of Constantinople has any real juridical authority. This is slightly problematic since the Russian Orthodox Church is, by far, the largest autocephalous Orthodox Church in the world. History has shown that it is the Bishop of Rome, guided by the Holy Spirit, who safeguards orthodoxy at ecumenical councils. This is where the Orthodox churches could really benefit from uniting with Rome. The successor of Peter provides substantial canonical unity and clarity of teaching from an integrated—Eastern and Western—perspective. 6. Hope for Christian Cooperation: Francis and Bartholomew will likely focus on continued cooperation in a Christian front against radical secularism and Middle Eastern violence. Pope Francis’ phrase, “ecumenism of blood”, is striking. Those who kill Christians don’t ask if you are Lutheran, Catholic, or Orthodox before they kill you. We can pray for lasting peace through repentance, forgiveness, and charity. 7. 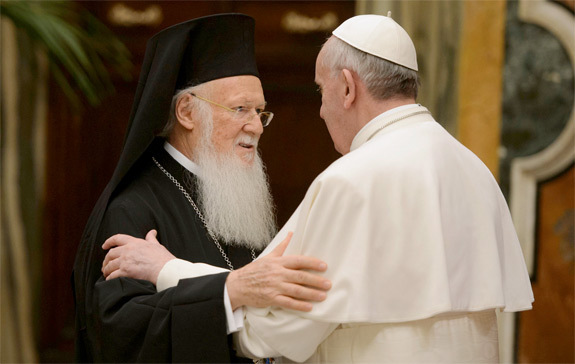 Patience: The Catholic Church has seriously pursued ecumenical dialogue with the Orthodox Church for the past fifty years. Vatican II was a monumental council which, lest we forget, hosted a number of Orthodox bishops. The Catechism of the Catholic Church has beautifully integrated Eastern Christian theology. The past several popes have already diminished the “papal claims” that Orthodox stridently decry and it appears that Francis may be willing to take this to a level that would surprise most Catholics. It seems there is not much more Catholics can do but fast and pray, show charity to our Orthodox brothers and sisters, and wait for the Orthodox Church to make some decisions about their own identity and future.